In a processor blend 1-1/2 cups yogurt with the rest of the ingredients until smooth and well blended; transfer to a large bowl. Mix in the remaining 1 cup of yogurt with a wooden spoon. Add in the chicken and toss to coat. Cover and refrigerate overnight. Prepare the grill to a medium-high heat. 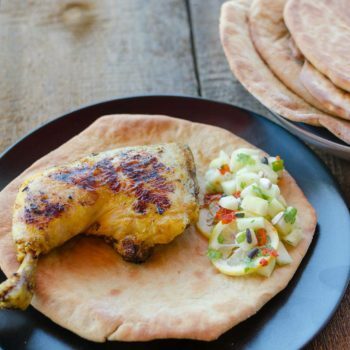 Place the marinated-coated chicken on the grill, do not wash off the yogurt marinade, but discard any marinade from the bowl. Grill the chicken (about 15 minutes per side) basting with remaining marinade the last 10 minutes of cooking on both sides, season with more salt and pepper if desired while cooking. Serve with naan bread.